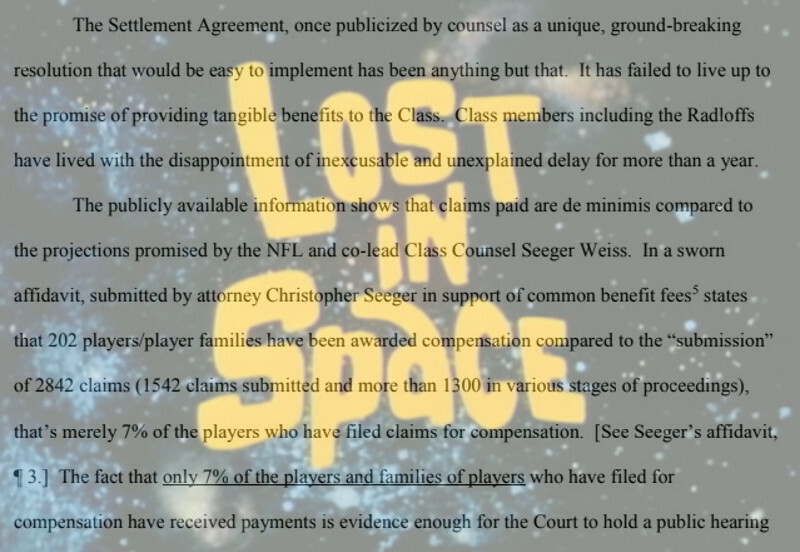 It’s a highly unusual development when class counsel in a class action settlement or multi-district litigation openly oppose each other – especially after a settlement has been reached, but the diabolical implementation of the NFL’s much heralded concussion settlement has forced just that. As Larry Coben, an attorney with Co-Lead Counsel Sol Weiss states in the motion, “claims involving Dementia and Alzheimer’s Disease have been unreasonably and inexcusably delayed, from the instance the Claims Administrator began accepting applications for compensation. “ While he stops just short of assigning blame to his counterpart Christopher Seeger, there is little room for doubt as he details the Claims Administrator’s refusal to address claims delays under the supervision of Mr. Seeger. The motion details the plight of Wayne Radloff, who in the delays has lost his home as his mind becomes more and more clouded and his wife, Garland strives to pick up the pieces of the mounting medical bills and constant care her husband requires. Wayne Radloff was part of one of the initial lawsuits against the NFL and his settlement claim was among the first filed. His attorney states the claim was filed on February 14, 2017 – over one year ago. He retired from the NFL at the end of the 1991 season and began seeing a doctor for cognitive issues in 2003, when he was only 42 years old. 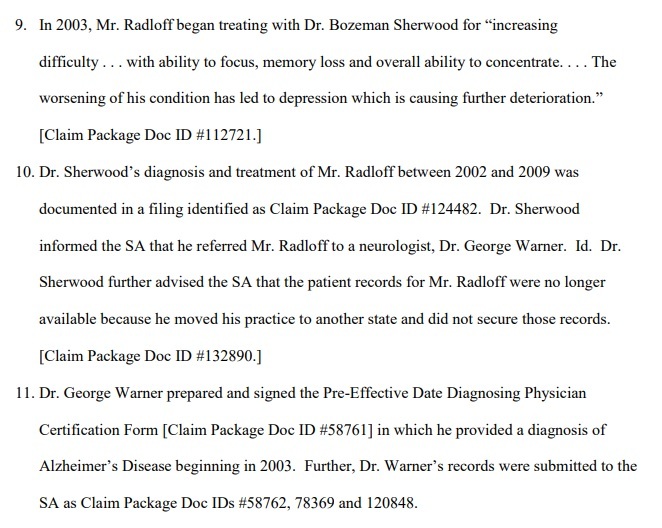 The motion contains excerpts from Radloff’s medical records showing a definitive diagnosis of Alzheimer’s disease. 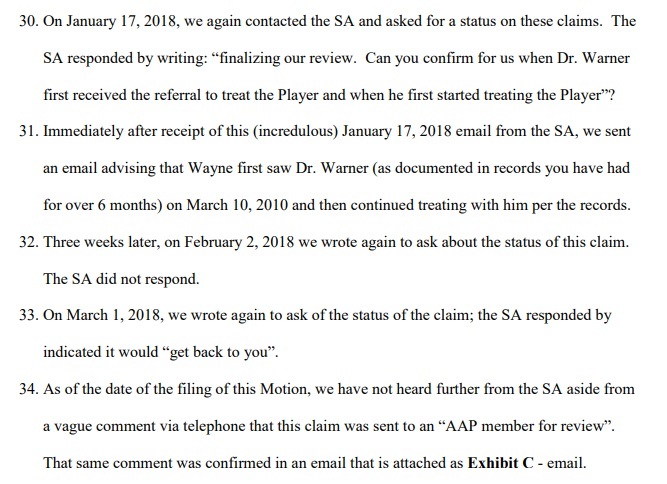 When the settlement was pitched to players before, and especially during the registration period, Chris Seeger and Orran Brown repeatedly emphasized that players with existing diagnoses, such as Wayne Radloff would submit a claim along with their medical records and should receive a check within weeks. Instead of living up to their promises, players like Radloff are still waiting – some more than a year later. February 14, 2017, Registered for Settlement and received a Claims package ID. March 23, 2017, Registration and Claims Package acknowledged. April 14 and April 18, Medical records and physician certification forms from Dr. Warner filed. June 9, 2017 – Deficiency notice issued citing an “invalid signature” and medical records did not reflect a qualifying diagnosis to 2003. June 9, 2017, Radloffs filed signatures as requested, and also filed a letter from Dr. Sherwood confirming his treatment of Wayne for the past 5-7 years. August 2017, Radloffs filed supplemental medical records including an NFL Physician Report which was used in his disability claim. August 30, 2017, Radloffs filed an additional report from Dr. Warner confirming his opinion that Mr. Radloff had been suffering from Dementia of the Alzheimer’s type since 2003. Between June and November 2017 the Claims Administrator ignored the Radloffs’ filings. In November 2017 the Radloffs’ attorney inquired of the Claims Administrator as to the status of their claim and was met with red-tape and evasive answers. On January 4, 2018, having received no updates the Radloffs’ attorney inquired of the claims administrator again. No response. And so the Radloffs’ continue to wait and to pray for relief, knowing no more than they did when they filed their claim over a year ago. “If you compare the Anapol Weiss Motion/Memo to our Motion to Determine Proper Administration, Response to Motion Extension Time and Affidavits, Motion for Reconsideration and Replies, the issues raised are exactly the same, changing the Settlement Agreement, adding new substantive requirements, adding difficult new procedures, interpreting settlement agreement language and making secret determinations by “agreement” between Co-Lead Class Counsel (Seeger Weiss not Anapol Weiss) NFL counsel and Claims Administrator, all without notice to class. Mr. Tighe is likely interested to see how the Court responds since his motion and others filed afterward have been opposed by the NFL which is not surprising but also by Chris Seeger who was appointed to represent the Class and look out for their interest. This hasn’t happened, and for reasons yet to be understood, Judge Brody has ruled in Mr. Seeger’s favor each time. For now, the Radloff’s and hundreds of others wait, anxious, stressed and wondering if they will ever see the relief that was promised to them. Epilogue: The day after this motion was filed, the Radloffs’ claim was approved for half of the projected amount. While the approval sounds good, the timing is no coincidence. Approval of the claim forced their attorney to withdraw his motion for a hearing as moot, and the slashing of their award appears to be in retaliation for speaking out against the unfair processes being exacted on the players.